Grand Central Publishing, 9781538761007, 88pp. 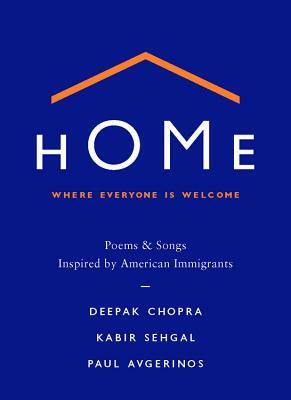 HOME is a collection of thirty-four poems and twelve songs inspired by a diverse group of immigrants who have made significant contributions to the United States. From Yo-Yo Ma to Audrey Hepburn, Albert Einstein to Celia Cruz, these poems symbolize the many roads that lead to America, and which we expect will continue to converge to build the highways to our future. This unique collaboration takes the form of a keepsake book, with a CD of beautiful original music tucked inside. An audiobook edition in which Deepak Chopra reads the poems is also available, as a digital download. This hardcover book (with accompanying music CD) and digital-only audiobook will be available simultaneously. Offering a welcoming feeling intended to inform our cultural conversation and enhance our national dialogue, HOME has twelve accompanying musical pieces that serve as personal meditations on the essence of home, in which you can reflect upon where you feel most welcome, whether a place or state of mind. Written and composed by immigrants and first generation Americans, HOME provides a stronger sense of welcome and belonging for everyone. Deepak Chopra, MD, FACP, is an immigrant who was born in New Delhi, India, moved to the United States in 1970, and became a citizen in 1984. He is an American author, lecturer and music composer who has contributed to seven albums and written over eighty-five books translated into over 43 languages, including numerous New York Times bestsellers. One of his songs Do You Love Me featuring Demi Moore hit #10 on Billboard and remained on the chart for thirteen weeks. He recited Nehru's "Spoken at Midnight" speech on Ted Nash's Presidential Suite, which won the Grammy Award for Best Large Jazz Ensemble Album in 2017. TIME magazine has described Dr. Chopra as "one of the top 100 heroes and icons of the century." As the founder of The Chopra Foundation and co-founder of Jiyo and the Chopra Center for Wellbeing, he is a world-renowned pioneer in integrative medicine and personal transformation, and is Board Certified in Internal Medicine, Endocrinology and Metabolism. He is a Fellow of the American College of Physicians, Clinical Professor of Medicine, University of California, San Diego, Researcher, Neurology and Psychiatry at Massachusetts General Hospital (MGH), and a member of the American Association of Clinical Endocrinologists. The World Post and The Huffington Post global internet survey ranked Chopra #17 influential thinker in the world and #1 in Medicine. Kabir Sehgal is a first generation American, and his parents are both from India. He is a New York Times and Wall Street Journal bestselling author of eight books such as Coined and Jazzocracy. Among his works are children's books that he has written with his mother, The Wheels on the Tuk Tuk and A Bucket of Blessings. He is also a contributor to Fortune and Harvard Business Review. A multi-GRAMMY and Latin GRAMMY Award winning producer, he has collaborated with jazz artists such as Chucho Valdés, Arturo O'Farrill, and Ted Nash. Kabir is also a composer and musician. A US Navy veteran, he works in corporate strategy at First Data Corporation in New York City. Paul Avgerinos is a first generation American, whose father Costas emigrated from Greece to the US in 1938. Paul is a GRAMMY winning artist, composer, producer, and engineer with 23 critically acclaimed New Age albums to his credit. He is active in creating scores for a variety of television shows and has also collaborated with Jewel, Run DMC, and Willie Nelson. Paul's multi-step, intuitive creative process includes archetype and style guide development, meditation, mantra and prayer. He is a graduate of the Peabody Conservatory of Johns Hopkins University. He runs Studio Unicorn and lives with his family in Redding, CT.